Roughly nine out of ten US businesses with at least 100 employees are using social media for marketing objectives in 2012, according to eMarketer, and many plan to increase their social media spend for the coming year. Despite this, many of these firms still have trouble making the case for social media investment, because they’re not able to track ROI success. In part this is attributable to social media’s evolution from being a small project outside of the budget process to being an integral part of the marketing plan. In the process, different metrics and approaches are needed to support the budget. In the short term, one alternative is to develop a cost-benefit analysis. 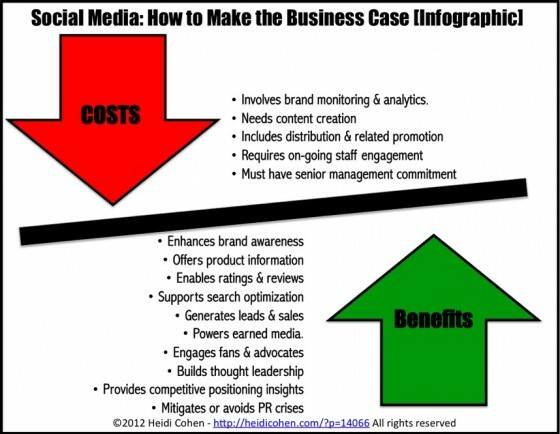 Here’s how to make the business case for social media. Social media enhances brand awareness. By being present and engaged on social media networks, companies cost-effectively increase brand awareness especially through the use of 360° branding. Social media offers product information and answers customer questions. By supplying the information that prospects actively seek at every step of the purchase process, social media helps close sales. This information can be found on blogs, videos, Tumblrs, Pinterest and other forms of social media. Social media provides the ratings and reviews consumers seek before purchase. Retailers and other forms of business can re-post ratings and reviews on their own website or let customers search for them on other sites such as Google, Amazon and TripAdvisor. Understand that even poor ratings can attract customers. For example, a low hotel review due to the noise of the area’s hot new bar can cinch the deal for a traveler seeking nightlife. Social media supports search optimization. Social media content can improve search rankings through their keyword focus, links and engagement level. Additionally, social sharing and other content forms like videos and images aid findability. Guest blog posting can also help achieve this goal. Social media powers earned media. When consumers find engaging and useful information along their purchase journey, they share this content more broadly. These social shares, referred to as earned media have the added benefit of an unspoken endorsement from the sharer. Social media engages fans and advocates. Social media networks provide the space for brand advocates to engage with each other over their desire to show their brand support. Social media builds thought leadership. Firms become known for being the expert in their space by creating and sharing their content, especially via a blog. Social media provides competitive positioning insights. By monitoring what’s happening in the social media ecosystem, you can distinguish your competitors and better understand their behavior. Social media mitigates or avoids PR crises. By having a social media presence, an organization is able to respond more quickly and effectively to a potential PR crisis once they’ve built a base of followers. Social media requires brand monitoring and analytics. This enables businesses to discern what’s happening in the evolving marketplace as well as how their business is perceived. Social media needs content creation. At its core social media runs on content. It’s critical for organizations to continually create great content or they risk alienating their existing fans. Social media includes distribution and related promotion. It’s important to get your content out to multiple social media locations such as Facebook, Twitter, and LinkedIn. Also don’t underestimate the importance of having your content re-distributed via RSS and other forms of syndication. Social media requires on-going staff engagement. Social media requires firms to be present and active. It’s not like a traditional campaign where you pay for promotion and it goes on autopilot. Social media must have senior management commitment. This is difficult to assess in terms of specific dollars but it’s critical to success. Without c-suite support, social media won’t be taken seriously. The bottom line is that the benefits from using social media far outweigh the costs. Further, the costs are low relative to traditional forms of outbound marketing. How have you made the case for using social media in your business? What would you recommend? Tags Earned Media, eMarketer. Bookmark the permalink.